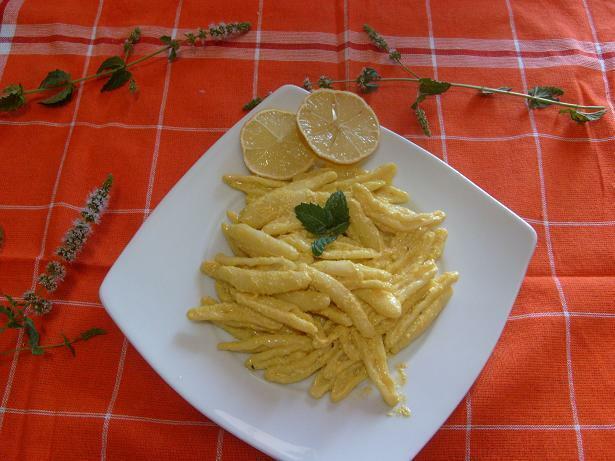 ホーム » レシピ » Maccheroni al limone. Sardinia Island. Sardinia, a beautiful island. I've always tried to understand his people and of course cuisine. It was not easy, but I think I have succeeded almost entirely. The people of Sardinia, is a bit closed, but very generous, as well as superb cuisine. Sardinian cuisine has influences from Spain and Genoa. The ingredients are simple, the sea and countryside. Even the art is so influenced, marine and mountain landscapes are inspired many painters. 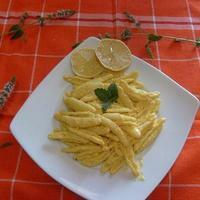 Today I present a recipe typical of farmers in Sardinia, " maccheroni al limone." A recipe that is made in minutes, as farmers around the world have little time to cook and eat. 320 grams of pasta "macaroni"
Very simple recipe but very tasty. As always take a large skillet, and pour the lard. Cook over low heat for two minutes. Add the filtered juice of two lemons and a little salt. Cooking, always simmer for 5 minutes. Dissolve saffron in little warm water and pour into skillet. Mix well cook for another 2 minutes. Turn off heat and add all the grated cheese. Mix thoroughly until creamy. Cook pasta as usual, "al dente" pasta if you can not find the photos, you can use: feathers, macaroni, and any short pasta. Drain well and pour into the pan, mixing well. Serve hot and serve with a good white wine without bubbles. Until next time, and for any questions you know I'm here for you.